We all know of the extraordinary dishes that wood fired ovens can cook. In addition, these types of ovens produce healthier dishes because of their ability to cook in just a few quick minutes. 1. Oak. Oak is a kind of hardwood that burns longer than other kinds of woods. Most tend to use oak as firewood because it is readily available and relatively affordable, and because it burns longer and gives more heat, it cooks more dishes and is, therefore, more cost-effective. 2. Maple. Maple is another kind of hardwood that many opt to use, next to oak. 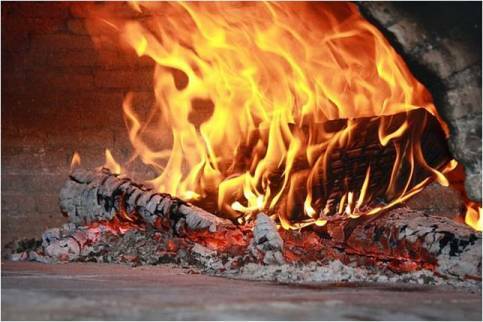 Maple wood is denser and therefore heavier than other wood and produces more heat that you can utilise to its full extent if you already own a wood fired pizza oven. 3. Cherry. Cherry is a kind of fruitwood, which, although is not as dense or burns as long as hardwood, is very popular among chefs. When burnt, all kinds of fruitwoods give off a unique fragrance, which enhances the flavour of dishes being cooked. 4. Apple. Apple is a unique kind of fruitwood. It is slightly heavier than other fruitwoods, so it burns longer and hotter, and it is best known for its sweet aroma and fragrance that give oven baked dishes, like pizza, a strong but sweet smoky flavour. In general, any type of wood that is available within your area may be used as firewood. It should be noted that it is all just a matter of checking the moisture content of the wood. There are those that are too dry to be used for firewood, while those that have high moisture content will not just burn very poorly, but also produce more smoke than you need. If you do the sourcing and cutting of wood for yourself, collect firewood off-season so that the sap is in the roots. Once cut, store it in a dry place for at least six months to a year so that the wood will be dried off properly. Although it was said that any kind of hardwood, softwood, or fruitwood would suffice, it is essential to ensure that your source of such is completely natural. Do not, in any case, burn plywood, cork, or any wooden material that has undergone any chemical treatment. Using such to cook your food is very dangerous for your health. It is also not recommended to use charcoal. Although it works fantastically for grilling, that is the only cooking method that it is good for. Charcoal burns longer and hotter, definitely, but it produces too much carbon monoxide which not only makes your food unsafe to eat, it also degrades the quality of the air.